My old boss James Brown has launched an online magazine called Sabotage Times and is asking like-minded souls and acquaintances to contribute suitable, unpublished material. 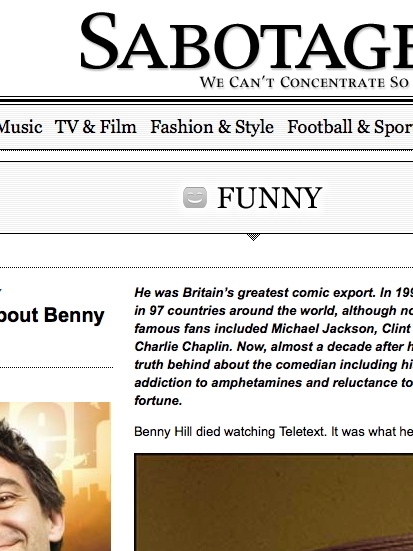 I discovered a pretty exhaustive article about Benny Hill I wrote in the late 90s and updated it. You can read it here. I actually wrote it for XL, an Emap men’s magazine that folded soon after. (They published an interview of mine with Jack Dee and a similar hagiography of Sid James while they were still running.) The Benny Hill, which I later failed to flog to GQ, is a pretty straight, factual biography of the man, which I remember researching in those prelapsarian times before broadband and Wikipedia by – read it and weep, youngsters! – tracking down books in secondhand bookshops and buying them, then taking them home and reading them and copying salient facts down. Ah, the age of innocence. Still, nice to see it in print. There’s plenty of other stuff to read there, too.